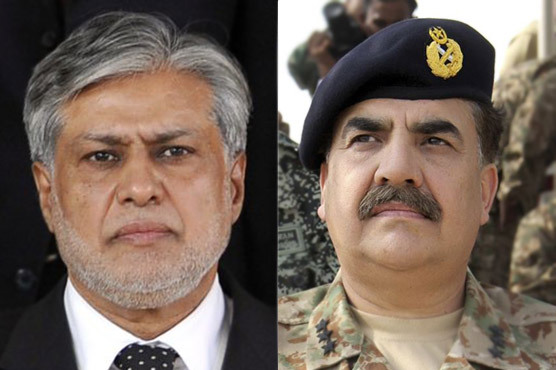 Federal Finance Minister Ishaq Dar called on Chief of Army Staff (COAS) General Raheel Sharif on Wednesday (today) at General Headquarters. According to Inter Service Public Relations, financing matters related to capacity building for effective Pak-Afghan border management including raising of fresh 29 Civil Armed Forces wings were discussed. Earlier, Prime Minister Nawaz Sharif, who is due to address the United Nations (UN) General Assembly session today phoned Chief of the Army Staffs (COAS) General Raheel Sharif to discuss the situation in the region. The scenario in the region was tensed following Sunday’s attack on an Indian army camp in the held Kashmir, which New Delhi blamed on Pakistan. A brief official statement issued by Pakistan’s mission to the UN said that the conversation between the premier and General Raheel Sharif took place ‘at length’.